Now in its 19th year, Oklahoma Research Day is a premier annual event celebrating student and faculty research, creative, and scholarly activities. The event has grown in numbers and in stature with contributions from all of Oklahoma's institutions of higher education, including many collaborative contributions from national and international academic and research institutions. 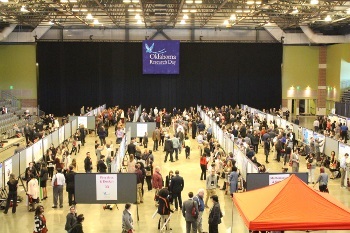 The 2017 Oklahoma Research Day event in Enid had more than 1,000 registered students, faculty, and guests and featured more than 550 unique poster presentations. Northwestern Oklahoma State University is proud to once again host Oklahoma Research Day in Enid. Details concerning directions to the Central National Bank Center, the city of Enid, local restaurants, and parking will become available to participants via a mobile app in February 2018. Check this webpage and the official Oklahoma Research Day webpage for updates about the app. ORD 2018 will be held at the Central National Bank Center (301 S. Independence Ave., Enid, OK 73701) on March 9, 2018. Schedule is available below. Registration for Oklahoma Research Day 2018 is available until 11:59 p.m., Wednesday, January 31, 2018. To register as a submitting author, co-author/presenter, or attendee, log in or create an account with Oklahoma Research Day. If you're an author or co-author, we'll need information like your name, institutional affiliation, project title, and abstract. Once you register, you should receive an immediate confirmation email. Posters cannot exceed 2,025 square inches (i.e., 45" tall x 45" wide). Please correspond with the person who will be printing your poster before you begin creating it. Typically, poster printers use 42" paper and allow, excluding margins, for 41.6" of printable space. Although a 45" square poster is allowed, the poster printers at your university may not be able to print that size of poster. 5. Save your slide to preserve your dimensions. Although you are not required to upload a poster, we encourage you to upload it for archiving purposes. If you upload a poster, anyone who is searching through the submitted abstracts after the event will be able to view your poster via the Oklahoma Research Day website. 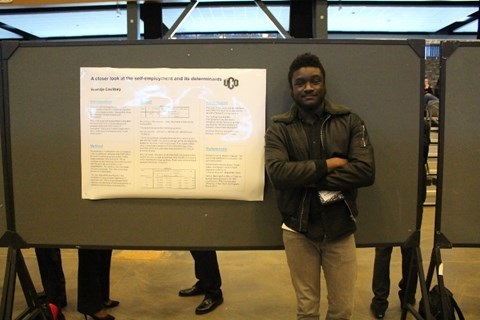 You can upload your poster anytime before abstract submission closes or after the event. The electronic version of your poster cannot exceed 2 MB in size and must be either in .pdf or .jpg format. Your title must be less than 200 characters. When formatting your title, capitalize all words with the exception of words with three letters or less. For Example: "The Diffusion of Information Communication Technologies at the Local Level of Government." Your abstract should be no more than 1,500 characters. Use a word processing program to type your abstract and rely on the word count function to verify the number of characters with spaces. In addition, allow the word processing program to check for misspellings. 4. Summary fo the findings or relevant results associated with the project. Examples of successful abstracts can be found in Oklahoma Research Day's Abstract Archives. The official guidebook will be released in the weeks after the registration period closes. Check back in February 2018 for updates. Oklahoma Research Day's 2018 keynote speech will be delivered by Dr. Tyrone B. Hayes, Professor of Integrative Biology at the University of California, Berkeley. Dr. Hayes' research "focuses on the role of steroid hormones in amphibian development." To learn about Dr. Hayes' research, check out his faculty profile. Follow us on Facebook and Twitter: @OKResearchDay.